completely disappeared from Western Europe after the fall of the empire. "Ostia Antica Dolia" by AlMare - Own work. Licensed under CC BY-SA 3.0 via Wikimedia Commons. Economic history blogger Pseudoerasmus published an interesting pair of posts earlier this month titled "Economic Growth in the Ancient Greece" and "Ian Morris' Calculations About the Ancient Greece Economy" in which he takes issue with the estimations historians Josiah Ober and Mogens Herman Hansen and archaeologist Ian Morris have developed to measure economic growth in classical Greece. I recommend reading the two post in their entirety. They are an interesting case study in the difficulty facing anyone who tries to apply economic theory to or gain cliometric insights from the ancient past. The problem is one of data. We simply don't have it. There was no National Bureau of Economic Research, Economic and Statistics Administration, or Bureau of Labor Statistics, or Federal Reserve Division of Research and Statistics in the world of ancient Greece or Rome. While folks like Angus Maddison, Walter Scheidal, Dominic Ratheborne, Chris Wickham and a few others have tried to estimate or model the real wages, labor supply, and GDP per capita of the ancients, ancient economics remains an imperfect art. Wage data is particularly tricky--while useful for understanding economic change within specific classical societies, I cannot think of a wage estimate built on ancient data I would trust in a comparative study. To try and get around this archaeologists, historians, and the occasional eccentric economist who turns his gaze to the far past will use proxies to gauge the extent of economic growth. Scholars will get quite creative with these proxies; they range from measuring the size of homes to the number and type of animal bones found in trash heaps. One of the most popular proxies are measures of health: things like disease incidence, average age of mortality, and height. There are good reasons for their popularity: they do not need to be fed into complex mathematical models to be used, the source of their data (skeletons) are relatively plentiful, they record the well being of average farmers as well as elites, and can easily be used to measure one society or time against another without the usual challenges that come with comparing quantitative data drawn from radically different social contexts. The term "wealth" is used very loosely in this blogpost. You need to keep in mind the difference between a society's production per capita and the incomes received by the median person. The former says nothing about how the incomes in the society are distributed, so there may be a lot of income per capita but the median person may be benefiting very little from it. Stature is a very good proxy for incomes received by ordinary people, especially before the 20th century. There is a big debate on whether wages for the working classes rose during the first phase of the Industrial Revolution or no. Robert Allen for example is a very prominent "wage pessimist". If real wages fell in the period 1800-50 then there is no height paradox. But this loose use of the word "wealth" most afflicts your statement about the Roman empire. It's plausible that the median Roman was better off in the 1st century than in the 6th, but who says the median inhabitant of the Roman empire was NOT better off in the 6th century than in the 5th? I will concede that in that earlier post I used the phrase "wealth" in a rather loose way. In less than 1,300 words I moved from industrial America to premodern agrarian empires to hunter gatherer bands. It is difficult to talk about any one variable that might describe all three economic systems without stretching its meaning a bit. What is really necessary in order to make useful comparisons between such different eras is a discussion of fundamentals: is there a meaningful conception of wealth that applies equally well to the paleolithic hunter gatherer and the information age office worker? What exactly is this thing we call "wealth"? I cannot promise answers to these questions--I imagine it would take an entire book to answer them, and there are other topics much higher up on my priority list of things I plan to write books about. However, I do not think it is wasted effort to explore these questions a bit and see if we cannot approach proper answers to them. I must reserve a full exploration of that topic for a later post. Before I delve into it I would like to clarify why I think biometric data--especially average height--is often a poor proxy for wealth and why measurements of a population's biological standard of living should not be confused with a population's wealth. A good place to begin is with the Roman case study mentioned above. I was surprised to find it faulted as my weakest point, for I consider it the strongest and least controversial of the examples given. Roman cliometrics are only slightly more solid than the uncertain attempts to piece together the size of the Greek economy discussed in Pseudoeramsus's posts. The most interesting data used in these studies involves wage estimates constructed from payrolls recorded on Egyptian papyri. Unfortunately, there are no comparable records for the Western Empire and we must study the economics of that empire's fall by using what material proxies for wealth that might survive until some archaeologist digs it out of the earth or sea floor. The most accessible introduction to this topic is Bryan Ward-Perkin's classic The Fall of Rome and the End of Civilization. As Ward-Perkin's title might suggest, the archaeological record shows that the collapse of the Western Empire can be seen in the collapse of an entire material culture--a "civilization." For awhile it was fashionable for historians to downplay this event, speaking not in terms of the empire's fall and Europe's descent into a "dark age" but of a "transition" or "evolution" of Europe into "late antiquity." Ward-Perkins will have none of this. He fights sophistry with data, providing one example after another of catastrophic collapse. "In the post-Roman West, almost all of the material sophistication disappeared. Specialized production and all but the most local distribution became rare, unless for luxury goods; and the impressive range and qualities of high quality functional goods, which had characterized the Roman period, vanished, or at the very least, were drastically reduced. The middle and lower markets, which under the Romans had absorbed huge quantities of basic, but good quality items, seem to have almost entirely disappeared. Pottery again provides us with the fullest picture. In some regions like the whole of Britain and parts of coastal Span, all sophistication in the production and trading of pottery seems to have disappeared altogether: only vessels shaped without the use of the wheel were available, without any functional or aesthetic refinement.... In other areas, such as Northern Italy, some solid wheeled turned pots continued to be made and some soapstone vessels imported, but decorated tablewares entirely, or almost entirely disappeared and even among kitchenwares, and the range of vessels being manufactured was gradually reduced to only a few basic shapes. 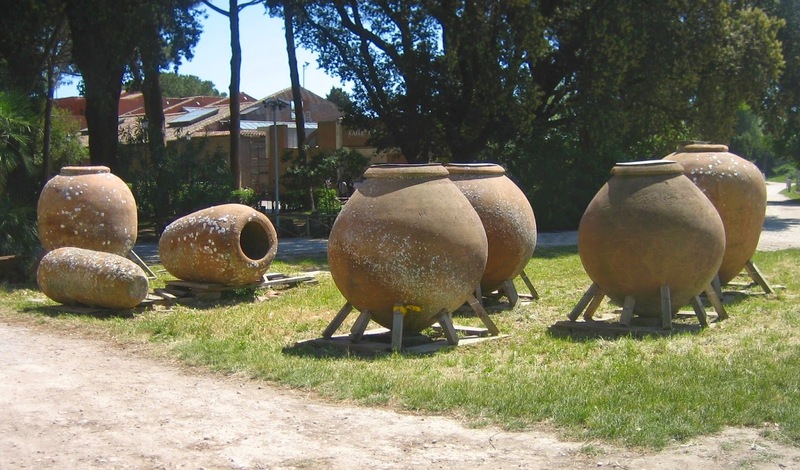 By the seventh century the standard vessel for Northern Italy was the olla (a simple bulbous cooking pot) whereas in Roman times this was only one vessel type in an impressive batterie de cuisine (jugs, plates, bowls, serving dishes, mixing and grinding bowls, casseroles, lids, amphorae, and others). Ward-Perkins provides more examples, but this is sufficient for our purposes. The trend is clear: the quality and quantity of every-day material goods fell as the empire went into decline. Importantly, this was not just an elite affair. The decline was most dramatic in the households of the West European peasantry, not the West European nobility. The average European farmer in the 8th century lived in a worse house, bought far fewer of possessions from long distance trade, owned fewer possessions over all, and owned material goods of a lower quality than his 2nd century predecessor. He was also more than three centimeters taller. Average height of skeletons found in Western European archaeological sites, 1st to 18th centuries. We thus have two proxies for wealth that moved in different directions at the same time. In terms of health the average European farmer was substantially better off than before; in terms of material possessions the same farmer was in a substantially worse position. How do we reconcile this? Which measure better accounts for this thing called "wealth"? One valuable characteristic of the Bavarian prisoner data sets is the capability of distinguishing among the effects of nativity in the several regions. These regions differed notably in the composition of their agricultural output. While some emphasized milk and dairy products in their production mix, others concentrated on potatoes and still others on bread grains. Surveys from the mid-century allowed us to assign each observation values that represented per capita agricultural production levels in their birth region: milk production as of 1840, potato production as of 1853, and bread grains also as of 1853 (no author, 1854–1859; see also Baten, 1999 for further explanation). To model potential nonlinearities and substitutabilities we used both linear and quadratic terms for the food-production variables. The implication of these results is that the height of average lower-class Bavarians was strongly influenced by first the availability of milk and secondly the availability of potatoes in a given region. Baten and Stegla found similar results in a long-range study of heights across the modern Near East during the 19th century. Here again we find that populations with most access to milk products--in this case Bedouin tribesmen--were far taller than their countrymen. Perhaps the most interesting study along these lines, however, was Koepke and Baten's attempts to measure dairy production in the Roman and post Roman world. These are the same two researchers that originally reported the drop in average height as classical civilization expanded across Western Europe and then its three centimeter jump after the empire fell. What they found is that the prevalence of cow bones in trash heaps moved in parallel with the decline and jumps in human height. Archaeological sites from the zenith of the empire had few cattle remains, but plenty of bones from swine. In other words, the changes in the average height of European farmers during the Roman and post Roman worlds can largely be explained as a function of the access these farmers had to the proteins found in dairy products. As purchasing and feeding a cow requires a larger capital investment than purchasing and feeding a pig one could conclude that access to dairy is simply a measure of household wealth by another name. I do not think this fact alone tells the entire story. The prevalence of cattle over swine or pasturage over wheat cropland may just as well reflect a decision on the part of households to focus on the goods which would trade at the highest price on regional markets. Whether or not cultivating these goods created a side product that substantially improved the health of their children would be less important than the market price of wheat, leather, beef, pork, etc., and the cost of devoting farmland to their production. This also holds true for those peasant farmers too poor to raise larger amounts of livestock themselves or wage workers who did not raise livestock at all. Their access to protein rich dairy products were just as much a product of their location as of their wages or household wealth. This is the problem with using "biological standard of living" as a straight proxy for wealth. There are simply too many intervening variables that complicate the picture. In the case of European data, the heights recorded over the centuries clearly reflected average household income--but they also reflected average household dairy consumption. Until economic historians begin controlling for dairy consumption in their models, measurements of biological standard of living that rely solely on height data must be used with caution. T. Greer, "Health ≠ Wealth," Scholar's Stage (22 March 2015). Pseudoerasmus, comment #2 (25 March 2015), on T. Greer, "Health ≠ Wealth," Scholar's Stage (22 March 2015). For an introduction to this line of study see Walter Scheidel, ‘Real wages in early economies: evidence for living standards from 1800 BCE to 1300 CE’, Journal of the Economic and Social History of the Orient 53 (2010), 425-462. Bryan Ward-Perkins, The Fall of Rome and the End of Civilization (Oxford: Oxford University Press, 2006), 92. The matter is complicated somewhat by the fact that heritability itself can vary within a genetically similar population living in different environments--a fact I chalk up to reaction norms. 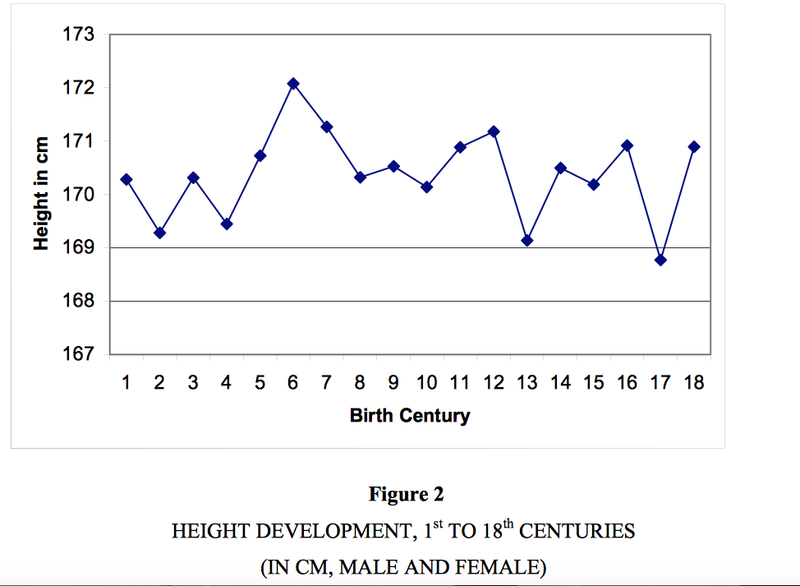 For a lucid introductory discussion of this topic, please see Lai Chao-Qiang, "How Much of Human Height is Genetic and How Much is Due to Nutrition? ", Scientific American (11 December 2006). Jo¨rg Baten and John E. Murray, "Heights of Men and Women in 19th-Century Bavaria: Economic, Nutritional, and Disease Influences," Explorations in Economic History 37 (2000), 361. Nikola Koepke, "Regional Differences and Temporal Development of the Nutritional Status in Europe from the 8th century B.C. until the 18th century A.D.," PhD Diss., Universität Tübingen (2008), p. 100. Jo¨rg Baten, "Protein Supply and Nutritional Status in Nineteenth Century Bavaria, Prussia and France”, Economics and Human Biology 7, iss. 2 (2009), 165-180. Mojgan Stegla and Joerg Baten, "Tall and shrinking Muslims, short and growing Europeans: The long-run welfare development of the Middle East, 1850–1980," Explorations in Economic History 46, is 1 (2009), 132–148. As much of the material here at The Stage narrates the history of Chinese warfare, diplomacy, and strategic thought or analyzes contemporary Chinese politics and international relations, I am occasionally asked a question that goes something like this: "Mr. Greer, if you had to recommend one book to help me understand how the United States should respond to the rise of China, what would it be?" The question is a good one. 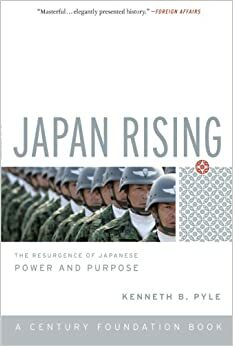 My answer always surprises: historian Kenneth Pyle's Japan Rising: The Resurgence of Japanese Power and Purpose. In writing this Mrs. Clinton spoke for much of America's foreign policy establishment. Alas, the popularity of this idea does not prove its truth. The central problem with this declaration is that U.S.-Sino relations do not occur in a vacuum. By design Washington's political and military relationship with Beijing is filtered through an East Asian alliance system built at great cost by American soldiers and statesmen. The hub of this system is Japan. Because of this America cannot have a purely bilateral relationship with China; the road to Beijing run through Tokyo. America’s challenge in the early years of the 21st century is to manage this trilateral relationship. Those who reflect on the history of American dealings in Asia will see the value of this approach. Sunzi’s famous dictum, “know your enemies” is sound advice , but the recurring lesson of the American historical experience is slightly different: know your friends. America’s allies have caused her more harm than most of her enemies ever managed. The United States did not defeat the Japanese Empire in the Second World War because American decision makers had a nuanced understanding of Japanese culture, society, and politics. In contrast, Americans' inability to grasp the real motivations of war time allies like Stalin, Mao, and Chiang Kai-Shek meant America ‘lost the peace’ in many theaters once the war was over. Likewise, America’s travails in Vietnam, Afghanistan, and Iraq had much less to do with damage inflicted by America’s sworn enemies than by a failure to perceive where the interests of our friends in Baghdad, Rawalpindi, and Saigon diverged from our own. It is possible to completely obliterate an enemy without ever truly understanding him. Working effectively with allies is trickier. Effective alliances do not rely on coercion, but coordination and communication. It is difficult—if not impossible—to act in concert with an ally if you do not first become familiar with their culture, understand the constraints domestic politics places on them, and gain a keen sense for how they perceive their own interests. This is despite the fact that no American initiative in Northeast Asia can succeed without Japan's full cooperation. We must remember that everything America does in its relations with China and the Koreas will have an immediate impact upon Japan’s security and its geopolitical position. If Americans do not understand (or bother to think) about how the Japanese perceive changes in U.S. strategy then there is real risk that Japanese statesmen will—unintentionally or by design—undermine American undertakings. Thus the importance of Japan Rising. I will not give a full summary of the book here, for other reviewers have done this already and have done a fairly good job of it. For our purposes it is enough to say that Japan Rising traces the history of Japanese foreign policy from the time of the Meiji Restoration to the present day, searching for consistent patterns and themes that recur across the modern era. Pyle disagrees with the many commenters that emphasize the liberal, pacifist ethos of contemporary Japanese culture and who suggest that this will mark Japan’s approach to international crises in the future. He also argues against those that characterize Japanese society as inherently irrational and unpredictable, defined by random vacillations from one extreme to another. In Dr. Pyle's eyes the last 200 years of Japanese history have actually shown a remarkable consistency. He describes Japanese statecraft as the product of a conservative and hyper-realist political culture that puts the demands of foreign politics above domestic concerns and takes an unabashedly opportunist approach to improving Japan’s position in the international system. The statesmen who practice this art are acutely aware of which way international winds are blowing. Their actions do not stem from any deap-seated values or ideological constructs except a Machiavellian impulse to adapt to the world as it is instead of trying to forge a new world in their own image. Thus the Japanese leadership stands ready to abandon anything—ideologies, alliances, the entire political order their society is built upon, if necessary—that might stop them from adapting to a changing world and attaining a promised place in a new global order. Not everyone will be convinced by Pyle's arguments. I am not convinced by all of them. But they are the kinds of arguments every American concerned with the United States future relations with China or the Koreas needs to think deeply about. Reading Japan Rising will force them to do so. This is why I surprise friends hoping I will point them to another book on China. Figuring out whether Pyle's vision of Japanese statecraft is correct or whether the other paradigms described above come closer to the truth should be a central priority of American diplomats, statesmen, and citizens. American policy cannot succeed if the United States and Japan are working at cross purposes. If the United States wants to get its China policy “right” it must get its Japan policy right first. I suspect that some of my readers will find this argument disconcerting. Much of what I write attempts to make Chinese history, society, and politics understandable to those without any experience in the East Asia. Many readers attracted to this site are themselves "China hands" who have made this task a professional pursuit. Such efforts are noteworthy and laudable. As a China hand myself, it is not surprising that I agree with the common lament that there are not enough Americans with a nuanced understanding of Chinese culture and that those who have this understanding should be taken more seriously by the powers that be. The problem is real. But it is not dire. Given how parochial the American people are (and ever shall be) we have actually not done too bad on this count. These days even rural American grade schools offer classes in Chinese, while new, fancy initiatives to help the next generation of leaders become familiar with China (like the Schwarzman Scholars) are set up every month. Efforts like these will only increase in size and number as we move into the future. We live in an age where ambitious make their way to Beijing. Far fewer make their way to Tokyo. Herein lies my concern. If the China hands are under-appreciated, the Japan hands are unknown. Few are the programs that teach Japanese or to send young American businessmen and scholars to Japan. No one talks about how critical the U.S.-Japanese relationship is to the 21st century, nor how it will be the key to preserving global peace and stability. There is no recognition that Americans need a deep understanding of how their closest allies in East Asia think. But we do need this understanding, the decisions made in Tokyo will decide the future of peace and stability in East Asia, and for the moment there is no country more critical to the success of American strategy than Japan. The lack of attention Americans pay to Japanese affairs is troublesome. In the long run it may prove disastrous. See also: T. Greer, "It is Time to Talk Honestly About the U.S.-Japanese Alliance," The Scholar's Stage (10 August 2014). Hilary Rodham Clinton, “Security and Opportunity in the 21st Century,” Foreign Affairs (September 2007). S.C.M. Paine admirably describes both how Americans were able to defeat the Japanese despite their ignorance of Japanese culture (or even Japanese war aims) and how a failure to understand the interests and intent of her Russian and Chinese allies doomed the United State's efforts to establish a peaceful post war order in East Asa in The Wars For Asia: 1911-1949 (Cambridge: Cambridge University Press, 2014). I've said it before, I will say it again: everybody should read this book. Kenneth Pyle, Japan Rising: The Resurgence of Japanese Power and Purpose (Cambridge, MA: PublicAffairs Books, 2007), 15, 1. The literature on this question is voluminous. I will only provide here a few select examples of pieces I thought were particularly insightful--but which nonetheless downplayed Japan's role as an independent decision maker. See Jan van Tol, Mark Gunzinger, Andrew F. Krepinevich and Jim Thomas, AirSea Battle: A Point-of-Departure Operational Concept (Center for Strategic and Budgetary Assessments, May 2010); Douglas Pfeiffer, “China, the German Analogy, and the AirSea Operational Concept,” Orbis (Winter 2011); T.X. Hammes, Offshore Control: A Proposed Strategy for an Unlikely Conflict (National Defense University Strategic Forum, June 2012); Elbridge Colby, "Don't Sweat AirSea Battle," National Interest (31 July 2013); Sean Mirksi, "Stranglehold: The Context, Conduct, and Consequences of an American Naval Blockade of China," Journal of Strategic Studies 36, no. 3 (2013); Evan Montgomery, "Reconsidering a Naval Blockade of China: A Response to Mirski," Journal of Strategic Studies 36, no. 4 (2013); Amitai Etzioni, "AirSea Battle: A Dangerous Way To Deal With China," The Diplomat (3 September 2013); Bill Dries, "How to Have a Big Disastrous War With China" National Interest (27 June 2014); Robert Klein, "Keeping a Large War Small: Offshore Control Vs. Airsea Battle? The Case For Area Denial," Small Wars Journal (5 November 2015); Mark Morris, "Air-Sea Battle Vs. Offshore Control: Which Offers a Better Theory of Victory?" War on the Rocks (26 November 2014); Robert Haddock, "The Struggle for a Strategy," Proceedings 141, no. 1 (January 2015). I ask my readers to excuse me for the relative dearth of posts over the last month or two. The back log of posts is reaching intolerable levels, but it cannot be helped. In two weeks I will be moving away from the Hawaiian islands. Preparation for this move has swallowed up most of the free time I would normally devote to posting here--or engaging with the questions commentators have posed in recent threads. Things will be more settled at the end of April, at which point posting should continue at a more regular pace. I shall be leaving Oahu on April 15th and will spend the rest of that week (to the 20th) in Chicago. For at least a month afterwards I shall be living in Northern Utah. If there are any readers who live in the Chicago metro or along the Wasatch Front and would like to meet up, feel free to send me a message via the Scholar's Stage e-mail on the right. P.S. Other readers are welcome to consider this an "open thread" where they are free to discuss anything they would like (or anything they would like to bring to my attention). Suggestions on how I could improve the quality of this site are always welcome. Once things are settled down my goal is to post at least twice a week. I am also considering posting more short posts of this sort--that is, interesting excerpts from the books and articles I read that do not need detailed commentary on my part to be worth sharing.